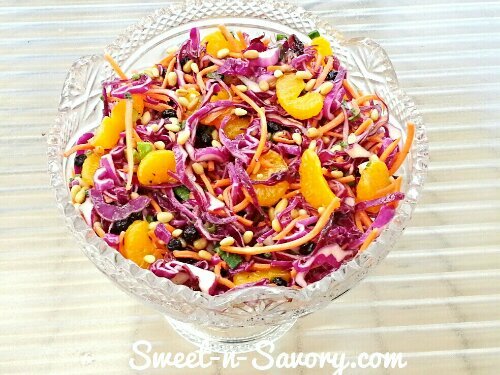 This beautiful salad is inspired by Susie’s Fishbein’s purple salad recipe in "Kosher By Design" cookbook. I’ have been making it for years for special occasions. It is as delicious as it is beautiful, a great accompaniment for braised veal. 2. In a jar or cruet, mix the brown sugar, pepper, salt, vinegar, reserved liquid from the oranges, oil, mustard powder, and garlic powder.